This entry has been hanging over me for sometime, and that I never published earlier was because I never thought I had it quite right, or it never felt complete. Though those feelings have not changed, I have (now) decided to publish what I have, intending that my theory will kindle interest and discussion to further develop it. What really is a demand curve anyway? Do they really exist? The reality maybe that they are not a real physical, tangible object, but instead show the possibilities of goods and services in terms of price and quantity; as with quantum theory, to produce such a curve invokes the ‘measurement’ problem. It is as if the demand curve is a superposition of all the possible outcomes, just as in quantum mechanics. The de Broglie wave function and the (consumer) demand function and corresponding curve, are both different manifestations of the same thing. This theory has been developed from my work on the fractal, and culminates my discoveries and insights from the fractal. Later I posited that the fractal, when isolated, or in a state of ceteris paribus, resembles – what I think to be by no coincidence – the characteristics of quantum mechanics, super-position etc, and have suggested – based on fractal mechanics – that they are one and the same. As if to say: to understand quantum, is to understand the fractal, and visa verse. If so, how? It is not so clear, but here is what I have. Where λ is the wavelength, h the Planck constant, and p is the electron's momentum (mv, mass x velocity). Fig. 1 (below) is a diagram illustrating this de Broglie function - it is a downward sloping log. log. function. Now, it is not my intent or my place to describe the de Broglie wave function more than this – I am really not the right person to do so, and besides you can easily find reference to it yourself – but I will say it was not the theory, more than what it suggested, that caught my attention. I knew I was on to something significant early on in my fractal quantum thinking when I identified that the fractal also demonstrates this wave particle duality. It was not until I saw the above diagram (Fig. 1) in an elementary physics textbook, that I realised that there maybe a direct relationship between demand and quantum - and something more significant to say about this most ‘unlikely’ of coincidences. The classical demand curve (fig. 2 below) is also a downward sloping log. log. function. It may well just be a coincidence, but what if it is not? What if there is a connection? If there is, I think with the fractal can trace it. It must at least have something to do with it, given my other discoveries. The demand curve (shown below in fig, 2) is a downward sloping curve showing the relationship between price of a good and the quantity demanded of the good. The curve illustrates the ‘law of demand’ - all else being equal, if the price rises, the quantity demanded falls, and visa verse. If there is any relationship between fig. 1 and fig. 2 then it maybe as simple as finding a connect between the variables price and quantity demanded (from classic economics) and the variables wavelength and momentum (from quantum mechanics). I am laying down a theory here. What I see. I expect there to be problems, and discussion. With this in mind, fractal theory would suggest from the outset that the two should be connected, universal, unbounded - irrespective of scale. One at a time, I have been analysing these variables and other related patterns, but have found no direct relationship as yet. 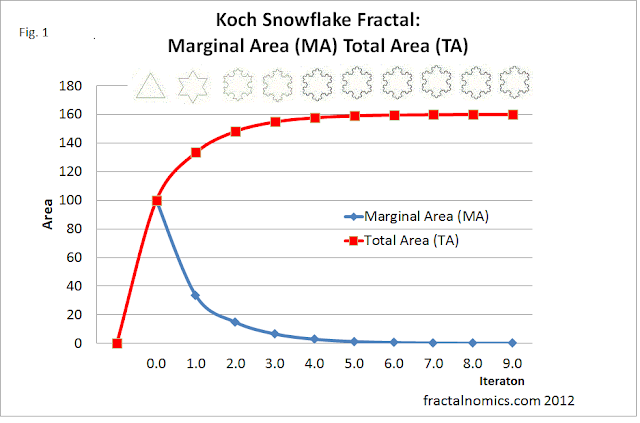 From the early work in this blog where I have suggested that utility, and thus price, is a fractal phenomena and that the relationship between price and utility can be demonstrated in the (Koch snowflake) fractal development - where the marginal (or additional or extra) area after each iteration demonstrates the demand curve. See diagram below. Fig. 3 Please excuse the misleading label 'Fig. 1' - near the title of this diagram. Fig. 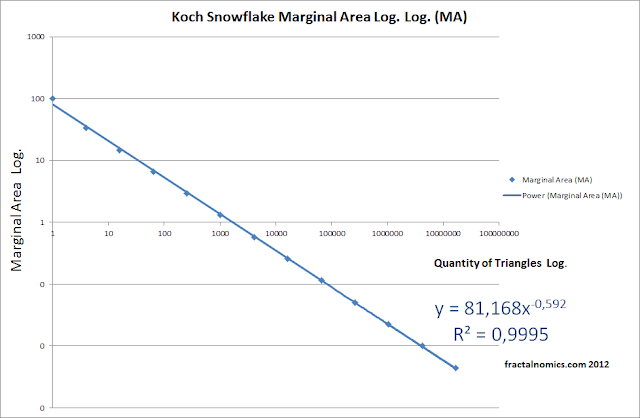 4 below illustrates the logarithmic relationship between the Area and the quantity of triangles: it demonstrates the creation of a strait-line demand curve from an exponential function ( Fig. 3 above). More recent discoveries from the fractal (in this blog) have suggested that there is a wave like nature to fractal development and that the MA curve above shows all the (infinite) positions (super position) of the triangles. Amplitudes (A), wavelengths (λ) frequency (f) are derived from, and can be demonstrated in, every fractal development, and they all increase in their magnitudes in an exponential manner that corresponds to the quantum nature of electromagnetic spectrum. 1. 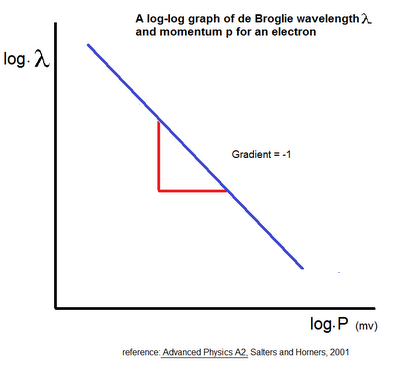 3 Is price (derived from the marginal area in the fractal) really the same as the wavelength in the de Broglie diagram? Directly, no. The price (as far as understood) is the amplitude of the wave, and not the wavelength. This should end the discussion, but for the fact that - and not withstanding the understanding that both Wavelength (λ) and the Amplitude (A) are independent of each other in classical wave theory - that the two (in the case of the fractal) are both inextricably linked as having an exponential nature, and both share infinity in their scale. It is as if λ is equal to or related to f . In discussions with mathematician's and from readings, it is suggested that this it quite possible. And, from wikipedia: '... and based on the theory of Fourier decomposition, a real wave must consist of the superposition of an infinite set of sinusoidal frequencies.' on the subject of electromagnetic wave equations. Can any relationship be derived between Qd and mv? Qd: is the quantity demanded for a good in a specific time period - so is a rate, or frequency. Qd is said to be exponential in nature, and is shown and demonstrated to be exponential (by use of the fractal) in this blog. Momentum is equal to mass(m) times velocity(v). There is no obvious concept of mass in the fractal, so mass may be assumed to be 0, but stemming from the wave nature insights of the fractal developed in this blog; the fractal does show concepts of velocity, and of frequency. I have nothing to conclude, no absolute finding ; but like all things I'm looking at, (I suggest) they cannot be overlooked. What have found is that the weaknesses of this analysis has exposed directly (for the first time) key issues of the fractal (and quantum) : time, distance and mass. The strange thing is (for me) is that an understanding of the demand curve requires a great deal of 'faith', just like quantum. Wouldn't it be a hoot: to think that 'economics' and 'physics' are connected.